A ventriloquist? Really? When did you start doing that? ...until his parents no longer thought this was a passing phase and realised he was serious. Andrew was determined to learn ventriloquism. As he became more confident he found a glove puppet in an op-shop for 20c. This was his entire week's pocket money, but was the best investment he has ever made. This puppet was a monkey with long, velcro arms, who Andrew named "Monksey". Yes, hardly the most creative name in the world, but Andrew was only seven at the time. Andrew excitedly showed his pastor his new ventriloquist skills, and next church concert Andrew was offered the chance to take Monksey on stage. Andrew's path as a ventriloquist had begun. The more serious Andrew got about the skill of ventriloquism, the more his desire grew to have a real ventriloquist figure. After many, many years of searching Andrew finally met Dudley. Ventriloquist dolls are very rare in Australia, making the meeting a very exciting once-in-a-lifetime opportunity to purchase a professional figure. Andrew was about fifteen at the time. His friends were all saving to buy cars, and Andrew bought a puppet. You can guess what kind of reaction that got! However all his friends' cars have long since been sold off / written off / rusted to bits. Dudley, in the mean time, is continuing to bring fun and laughter to the kids of Adelaide, not to mention Andrew! Andrew began working as a professional ventriloquist at around age 17, during late high school and then as he studied teaching at university. He also began adding magic tricks and balloon animals to his act. 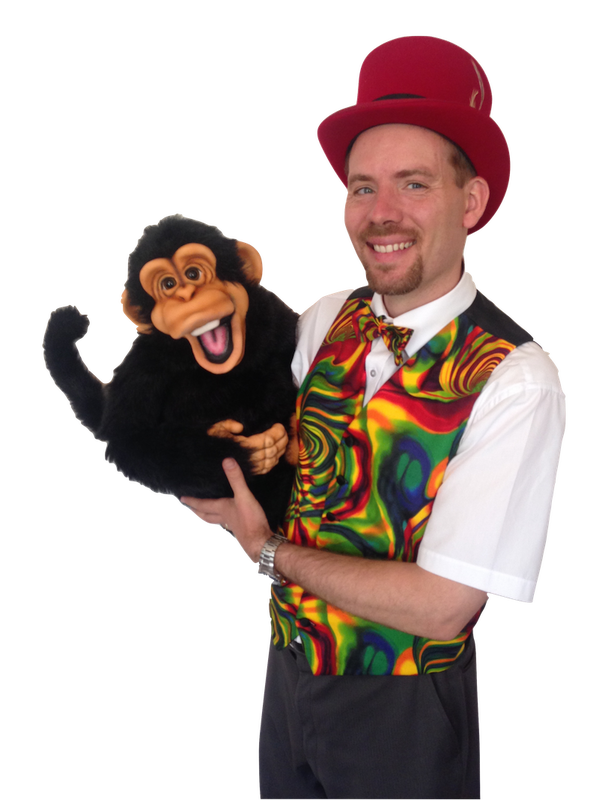 The combined ventriloquist and magician show made Andrew a popular guest at children's birthday parties, shopping centres and fetes around Adelaide. During this time he also hosted a breakfast radio shift at community radio station PBA-FM. It was here that Andrew really honed his improvisational skills. A one-man show, he had three regular characters he would voice for the show, as well as voices for "special guests" he would "interview". This banter between multiple characters earned him the station's "Dipole Award" for entertaining and innovative programming, but more importantly taught Andrew how to think quickly on his feet and switch between characters seamlessly. Andrew is now a part time teacher and during the rest of the week performs for schools, birthday parties and other events. Many of the families Andrew has met through his teaching career often ask to see Dudley again some time. So, this school holidays, look out for a Dudley show somewhere around Adelaide and come and join the fun! If you want to keep in touch with what Andrew and Dudley are up to, including dates and venues for shows, subscribe to our email list.